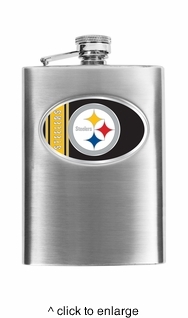 DETAILS: Score a touchdown when you order our personalized NFL Flask for your football-fan groomsmen. No fumbles with this great gift as you tackle your wedding plans! Stainless Steel 8oz Flask. Falcons, Eagles, Broncos, Cowboys, Patriots, Giants, Raiders, Cardinals, Ravens, Bills, Panthers, Bengals, Steelers, Packer, Redskins unavailable. .
PERSONALIZATION: Personalize with 2 lines up to 20 characters each line. *NOTE: Any images shown are subject to change as NFL teams change the 'artistic look' of individual team logos at-will. Flask look & feel as well as personalization will not change at any time. Fans will be pleased with their favorite team logos as team colors and/or mascots do not change.